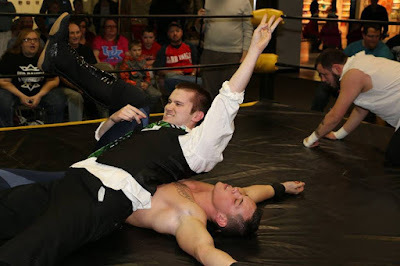 As a ring announcer for Stride Pro Wrestling, I try to not show favoritism toward the men and women who step through the ropes. But as a wrestling blogger, it's hard to not write about the promotion. It's a great way to help get the word out about a company I truly believe in and think has many great days to come. A few months ago two of the Stride Wrestling School graduates debuted with a new gimmick. Dexter Roswell and his bodyguard Brian Richards hit the ring, vowing to "make Stride great again." The two make a great pairing and the reaction they get from the crowd is perfect. 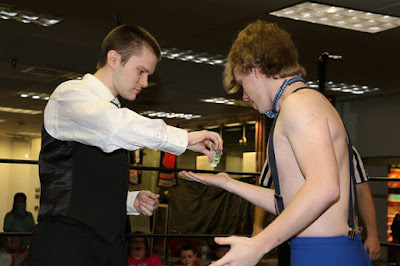 Roswell walks to the ring shaking hands and politicking only to get to the ring and insists on cleaning his hands with sanitizer. He makes his opponents use the sanitizer before shaking their hand. The routine makes me laugh every time and then Mr. Roswell cuts a promo burying the fans and the wrestlers in the back, including El Magnifico. At the One Year Anniversary Show, Roswell and Richards were battling the team of Eugene Drip and JD Wilk. Just as the good guys had the upper hand, referee Nathan Brag delivered a low blow allowing the DR Party to pick up the win. Moments later, Brag took off his striped shirt and revealed a bright red DR Party t-shirt. He joined Roswell and Richard in the middle of the ring standing proud. The DR Party was already headed on the right path. 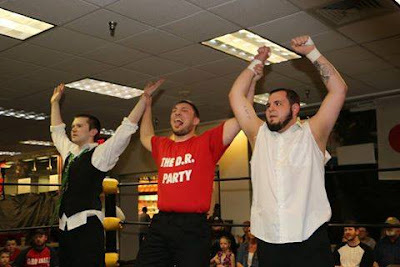 Now with Brag in the mix, this trio could end up causing, even more, chaos in Stride Pro Wrestling. It's great seeing young wrestlers succeed and chase their dreams. Stay tuned to see what's next for the DR Party on Saturday, April 8 at the Illinois Star Centre Mall in Marion.